What’s harder Parenting or manual labor? I’ve missed a few days updating my blog but it’s been for a good reason. We made arrangements to get our septic tank pumped later this week, and to save a few dollars I had the bright idea that I’d dig the cover up myself. We had talked to the woman at the septic company who pulled up our records and gave us an “accurate” description of where the four tank lids were that I would have to uncover. 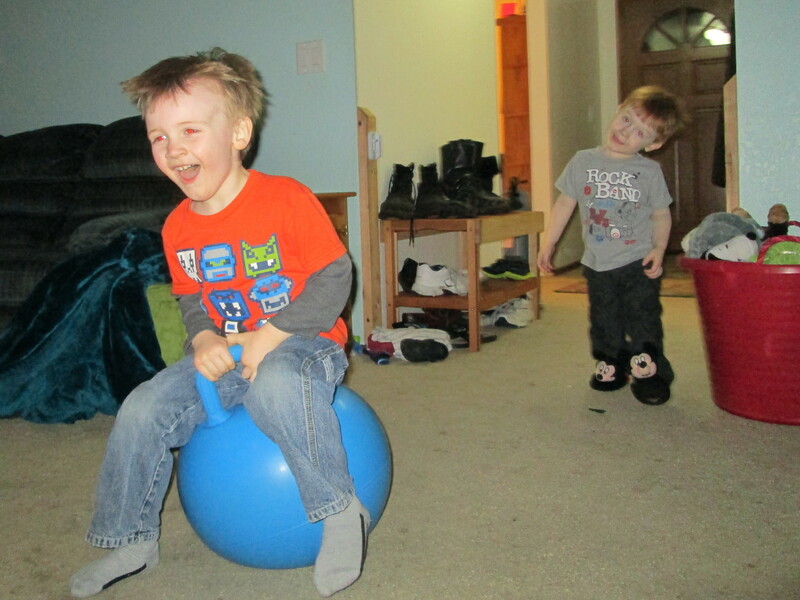 My lunatic children go crazy inside the house. I think I’m better off staying outside in the rain. Saturday morning I set to work eager to get this simple job out of the way as quickly as possible. This being Washington, it was raining of course which didn’t help anything. Carefully following the measurements I was given I calculated where the first lid should have been. I say “should have been” because of course, that’s where it wasn’t. I dug three feet down and found nothing. Wet, tired, and a bit frustrated I wasn’t sure where to try next. This was when the boys came out to “help”. They were thrilled to discover the dirt “Volcano” their Dad had built in the back yard. 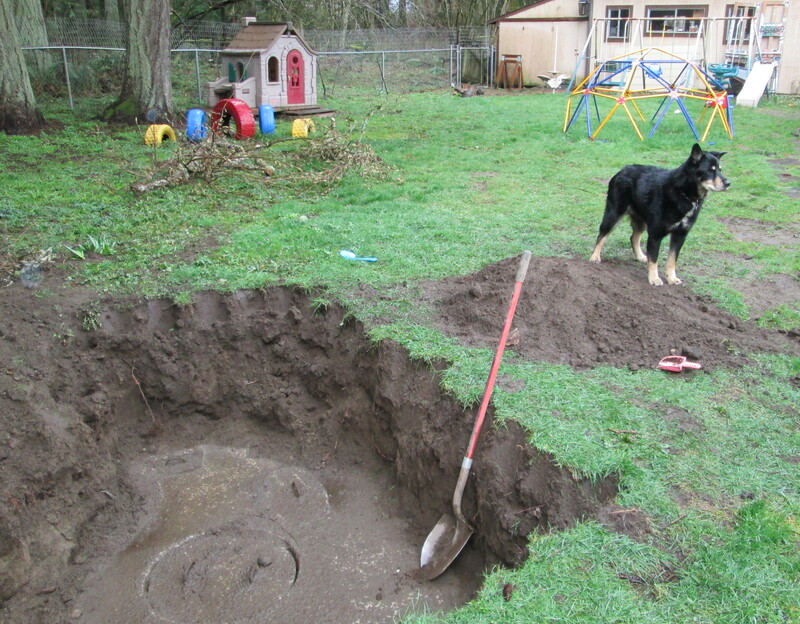 They climbed the dirt mounds over and over as I set about digging another hole in the yard hoping that this time the tank would reveal itself. Armed with toy sandbox shovels Zack and Josh decided I needed a hand. As I dug deeper they “helped” by replacing the dirt back into the hole while I was still standing in it. As the rain came down, so did the dirt. One of the few benefits of having a shaved head is that when my kids sprinkle dirt on me, it’s just a matter of brushing it off. After another half hour of digging, the new hole had transformed into a semicircular trench that now connected to my previous excavation. The elusive septic tank was still nowhere to be found. I was feeling defeated. What I had thought was a simple enough task, uncovering the four tank lids, had proven too much for me. All three of us were wet and muddy, but the difference between me and my young assistants was that they were still going strong while I was exhausted. That was when fate (and Mommy) intervened. Kat told the boys to get back in the house to get clean and warmed up before they get too cold and miserable. Since I was already cold and miserable, I opted to stay outside and continue searching for the giant cement box that was buried somewhere in the yard yet continued to elude me. My energy spent, the only thing that kept me going was that I was just too stubborn to admit defeat. Then, as I contemplated giving up once and for all I heard the noises coming from inside the house. It was total chaos. “I don’t want to change my clothes”, “Get off the bed with those muddy shoes!”, “I wanna go play!”, “Stop crying and take your shirt off”. And then the screaming started, and the crying, and the scream-crying. Should I go help, or stay outside and keep working? I had a choice to make, hard manual labor in the cold rain, or parenting my two crazed little boys. When push came to shove I chickened out. Opting for the easier of the two tasks, I began digging with new resolve. My victory! At long last I found it! Our idiot dog poses outside in the rain next to the uncovered septic tank. Eventually I found the tank. As luck would have it, I had been only a foot to the left of it on my first attempt, but had then started going in the wrong direction with my subsequent holes. The kids finally stopped giving their Mom grief and got warmed up and now, victorious in my quest, I staggered inside to get cleaned up. To celebrate we all went out to lunch. The kids were happy that they got to go out to a restaurant. My wife was happy that I’d dug up the tank, saved us some cash, and didn’t kill myself in the process. I just felt accomplished that I’d actually done something I’d set out to do, accomplished and exhausted… very exhausted. 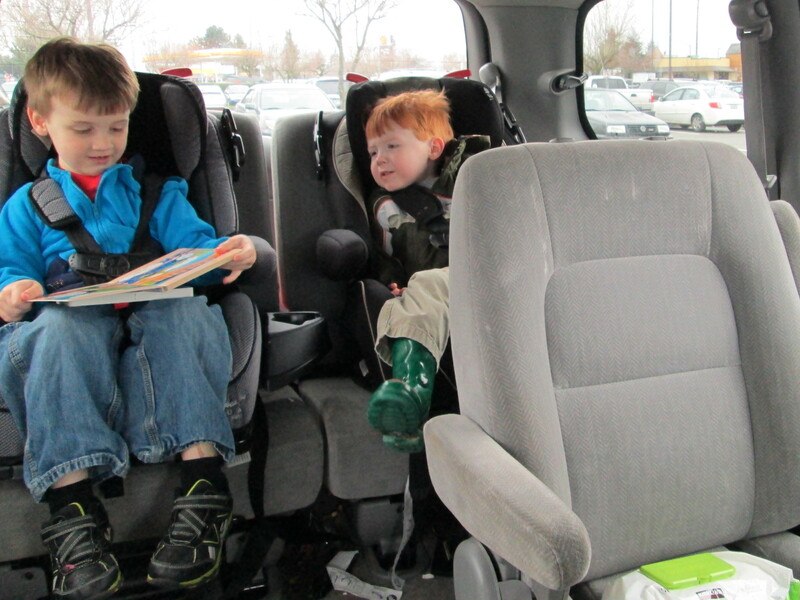 Much calmer now, Zack reads to Josh on our way to lunch. I may have gotten away with it this time, but I know next time I won’t get off so easy. Sometimes being a Dad means that there are jobs around the house that only a Dad can do and I’m alright with that. I took advantage of the situation. My eight month pregnant wife wasn’t going to be out in the rain digging up septic tanks. It sucked, it was hard work and I’m out of shape, but I consider myself lucky having gotten off easy. Kat is the one that had to deal with riding herd on two rambunctious little boys that didn’t want to be cooped up in the house, and that’s a lot more difficult that just digging a hole any day.